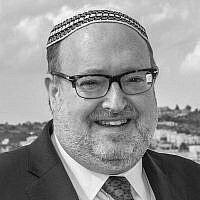 I write this at the conclusion of an energizing three-day conference in Venice, Italy in which nearly 50 Israeli emissaries trained by Ohr Torah Stone’s Straus-Amiel and Beren-Amiel programs, and currently serving as rabbis and educators throughout Europe, came together to discuss ways to strengthen the communities they are leading in the Diaspora in general and Jewish life on campus, in particular. 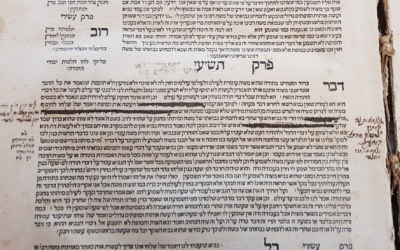 Due to the history of Christian censorship of Jewish texts and the strong presence of the Catholic church in Venice, we were curious to contrast the sacred Venice manuscript with the standard version of Mishneh Torah with which we are familiar. Would there be there any textual differences? 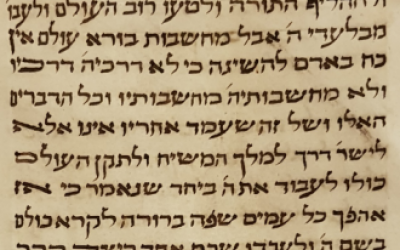 Indeed, the 1402 Venice manuscript did undergo some degree of censorship, particularly in “Hilchot Melachim,” the Laws of Kings, in which Maimonides writes about the concept of Mashiach (the Messiah), a uniquely tension-fraught topic with the Church throughout the millennia. Even Jesus the Nazarene, who imagined he would be the Messiah and was killed by the Court was prophesized about by Daniel as it says, “and also the children of the violent among your people will lift themselves up to establish the vision, but they shall stumble” (Daniel 11:14). Was there ever a greater impediment than this one? All the Prophets spoke of the Messiah, Redeemer of Israel and Savior and Gatherer of the Exiles and Strengthener of the Commandments. But this one caused the ruin of Israel by the sword and the dispersal of its remnant and its humiliation and reversed the Torah, and caused most of the world to err and worship a god other than God. וּלְהַחֲלִיף הַתּוֹרָה, וּלְהַטְעוֹת רוֹב הָעוֹלָם לַעֲבֹד אֱלוֹהַּ מִבַּלְעֲדֵי ה’. 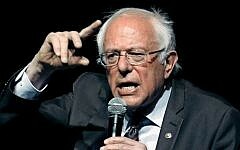 אֲבָל מַחְשְׁבוֹת בּוֹרֵא עוֹלָם אֵין כּוֹחַ בָּאָדָם לְהַשִּׂיגָם, כִּי לֹא דְּרָכֵינוּ דְּרָכָיו וְלֹא מַחְשְׁבוֹתֵינוּ מַחְשְׁבוֹתָיו. וְכָל הַדְּבָרִים הָאֵלּוּ שֶׁל יֵשׁוּעַ הַנּוֹצְרִי, וְשֶׁל זֶה הַיִּשְׁמְעֵאלִי שֶׁעָמַד אַחֲרָיו, אֵינָן אֶלָּא לְיַשֵּׁר דֶּרֶךְ לַמֶּלֶךְ הַמָּשִׁיחַ, וּלְתַקֵּן אֶת הָעוֹלָם כֻּלּוּ לַעֲבֹד אֶת ה’ בְּיַחַד: שֶׁנֶּאֱמַר “כִּי אָז אֶהְפֹּךְ אֶל עַמִּים שָׂפָה בְרוּרָה לִקְרֹא כֻּלָּם בְּשֵׁם ה’ וּלְעוֹבְדוֹ שְׁכֶם אֶחָד” (צפניה ג, ט). Nonetheless, the Thoughts of the Creator of the World are beyond any human understanding. For our ways are not His Ways, and our thoughts are not His Thoughts. And all the doings of Jesus the Nazarene and that of that Ishmaelite who came after him are to pave the way for the King Messiah and prepare the entire world to worship God together, as it says, “For then I will turn to the peoples a pure language, that they may all call upon the Name of the Lord, to serve Him with one consent” (Zephaniah 3:9). 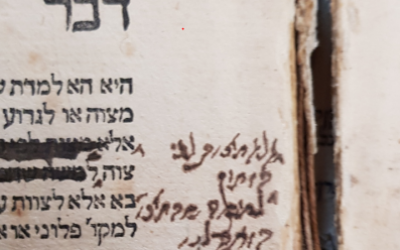 Comparing the following 16th Century manuscripts of Maimonides’ Hilchot Yesodei HaTorah (“Foundations of the Torah”) to the standard texts in use in our times, we again note the frequent instances of censorship. We see how methodical the censors were, deleting any word or statement that would have been an affront to Christian clergy and theology. For example, in Hilchot Yesodei Torah (9:1), Maimonides distinguishes between legitimate prophets and false prophets. …no prophet is thereafter permitted to make any innovation. Therefore, should a man rise up, whether he be from among the Gentiles or whether from among Israel, and deliver a token and perform a miracle saying, that God hath sent him to add a commandment, or to diminish a commandment, or to interpret a certain commandment of among the commandments with such interpretation as we have not heard by tradition from Moses; or he said, that these commandments with which Israel was charged are not forever and throughout all generations, but that they were commandments in keeping with those times only, behold him, he is a false prophet, seeing that he came to deny the prophecy of Moses; and his punishment is death by strangulation, because he willfully spoke in the name of God concerning that which He did not charge him; for He, blessed is He! commanded Moses, saying, that this enactment was “unto us and unto our children forever” (Deut. 29.28); and, “God is not a man that He should lie” (Num. 23.19). Additionally, the redactions are accompanied by hand-written comments, perhaps from a one-time owner of the text. Similarly, in Hilchot De’ot (3:1), (“Laws of Character Traits and Human Behavior”) we note how the censor redacted the Venice manuscript to exclude Maimonides opposition to asceticism as was practiced by monks. 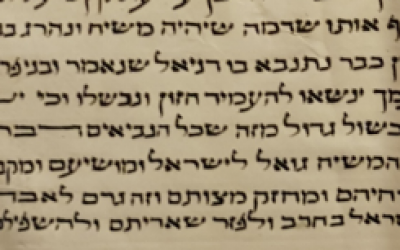 By contrast, the standard edition of Hilchot De’ot mentions pagan priests, which would have been an acceptable critique to the Christian theologians who could read Maimonides’ text. Lest a person will say: ‘Seeing that envy, desire and vainglory and like tendencies are evil tendencies and remove man from life, I will separate myself from them exceedingly and reach their remotest extreme.’ Until he will eat no meat, drink no wine, marry no woman, dwell in no comfortable quarters, dress in no proper clothes but in a sack and coarse wool, and the like, as for instance the idolatrous priests do. Even such is an evil way, and it is forbidden to follow it. 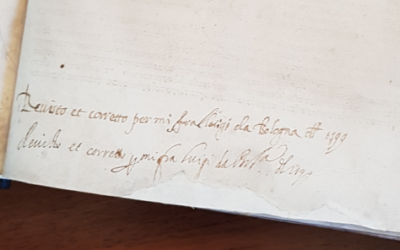 And at the conclusion of the volume the censor makes a notation in Italian attesting to the fact that he has accurately completed his work. My main takeaway from this textual tour of Jewish history is to appreciate how far we have come as a people since those days. Yes, we face very serious challenges, spiritually, politically, and more. But we do so from a position of strength, independence, and national pride. Here we are, at a conference in Venice, composing a new song in the same place where Jewish books were burned 451 years ago. This song allows creative and talented young men and women from Zion to spread across Europe, preserving and enhancing the Jewish community. 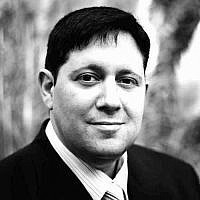 Thank God, Jewish life continues to thrives. That which the censors of times past wished to erase, instead continues to flourish and springs eternal.